Whether you know exactly what you want or need inspiration to achieve your dream, this service will ensure that your special piece is unique to you and absolutely perfect. Of course if you are inspired by something on the website, Sally can adapt it to suit you. Bespoke headpieces pieces start from £450 and earrings from £190. To find out exactly what goes into making a bespoke piece, click here. * Your name, contact number and availability for an appointment. Note that our bespoke service works globally; Sally can of course achieve everything via email communication depending on the type of piece. * Occasion you need the piece for with as much detail as possible i.e. I am getting married on 15th April in Sicily, I have found my dress and need a piece to complement this for my special day. * Include photos that will help Sally understand your style as well as names or images of pieces you like along with your dress, shoes and over all feel. Step3 - Sally will respond to you as soon as possible normally within 1 or 2 days of receiving your email. Step 4 - If you are happy to continue with the process a £80 deposit is required to cover the creation of design layout options for you to choose from as well as samples of desired materials. Step 5 - Once a design is chosen, Sally will work on creating your piece, stay in touch with photos of layouts and finally show your mock piece in the studio on a mannequin head so you can see exactly how it will sit. Meetings in person are preferred but all depending on where you live. Step 6 - When you are 100% happy with the piece (this is the exciting part) your accessory will be brought to life with a couture artisan who will work closely with Sally on the final touches of your bespoke item. Step 7 - Sally will send you photos of your final piece, you pay the balance and it will be sent to you via next day delivery. 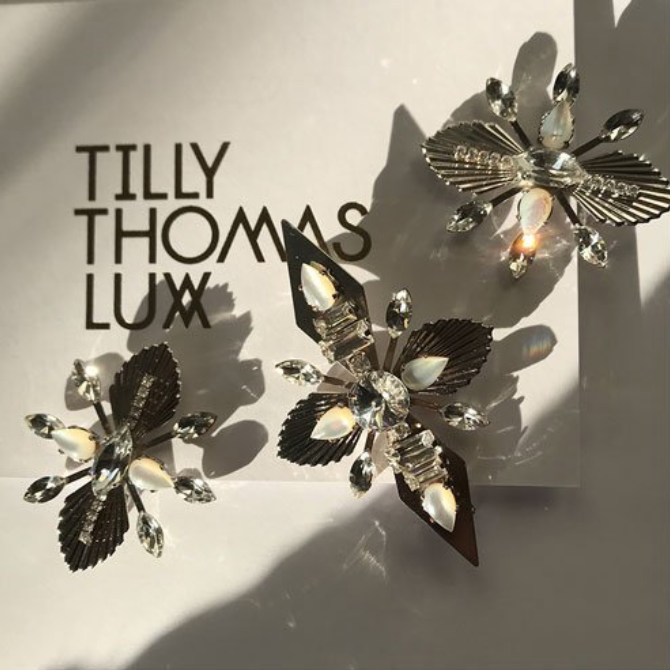 Your piece will be beautifully packaged in a Tilly Thomas Lux Box and carefully posted to you in time for your magical day.